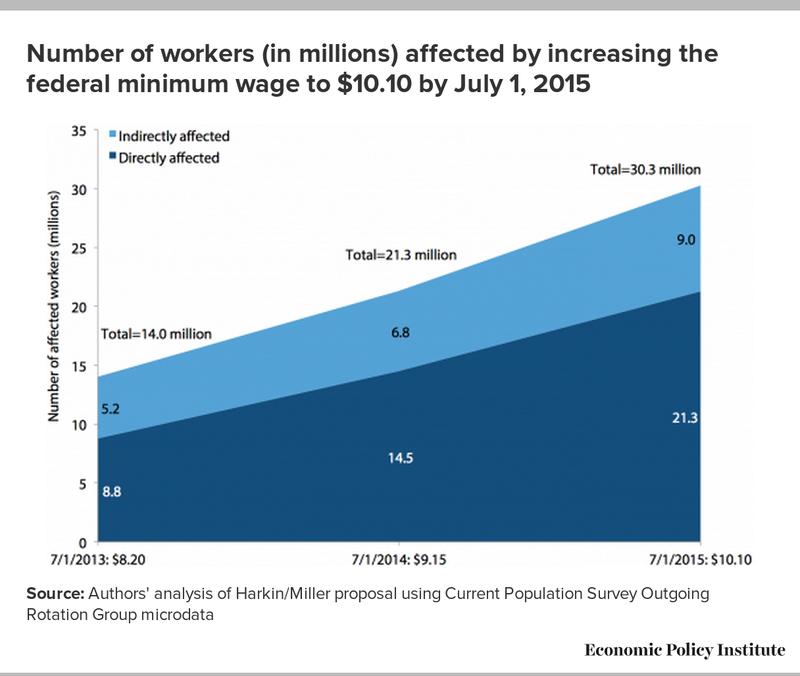 For newer research on the impacts of increasing the federal minimum wage to $10.10, see Raising the Federal Minimum Wage to $10.10 Would Lift Wages for Millions and Provide a Modest Economic Boost, released December 19, 2013. By highlighting the need to increase the federal minimum wage in his State of the Union address, President Obama breathed new life into a critically important issue. Wages for U.S. workers, particularly low-wage workers, have eroded not just in recent years, but over several decades (Mishel 2013; McNichol et al. 2012). This erosion has contributed to the growth of income inequality, leaving the economy less vibrant than if incomes were distributed more evenly. Raising the minimum wage and incorporating a system for automatic adjustment over time is key to reversing this erosion of low-wage workers’ earnings, and would help combat growth of income inequality. Following the president’s expression of support for a $9.00 minimum wage, Sen. Tom Harkin (D-Iowa) and Rep. George Miller (D-Calif.) indicated their support for increasing the minimum wage to $10.10 (this proposal follows their 2012 effort to pass legislation supporting a $9.80 minimum wage). Their proposal—now formalized as S.460, the Fair Minimum Wage Act of 2013—would increase the minimum wage via three incremental increases of $0.95, and then index it to inflation, so that as prices rise, so would the minimum wage. Also, the tipped minimum wage (the minimum wage paid to workers who earn a portion of their wages in tips) would be increased in $0.85 increments from its current value of $2.13 per hour, where it has languished since 1991, until it reaches 70 percent of the regular minimum wage. Raising the minimum wage would help reverse the ongoing erosion of wages that has contributed significantly to growing income inequality. At the same time, it would provide a modest stimulus to the entire economy, as increased wages would lead to increased consumer spending, which would contribute to GDP growth and modest employment gains. This paper begins by examining the minimum wage in context, noting where the minimum wage would be today had it grown at the same rate as other important benchmarks over the last few decades. It then provides a demographic overview of the workers who would benefit from the proposed minimum-wage increase, examining characteristics such as their gender, age, race and ethnicity, educational attainment, work hours, family income, and family composition. Next, it details the estimated GDP and job creation impacts that would result from increasing the federal minimum wage to $10.10. Those who would see wage increases do not fit some of the stereotypes of minimum-wage workers. Women would be disproportionately affected, comprising 56 percent of those who would benefit. 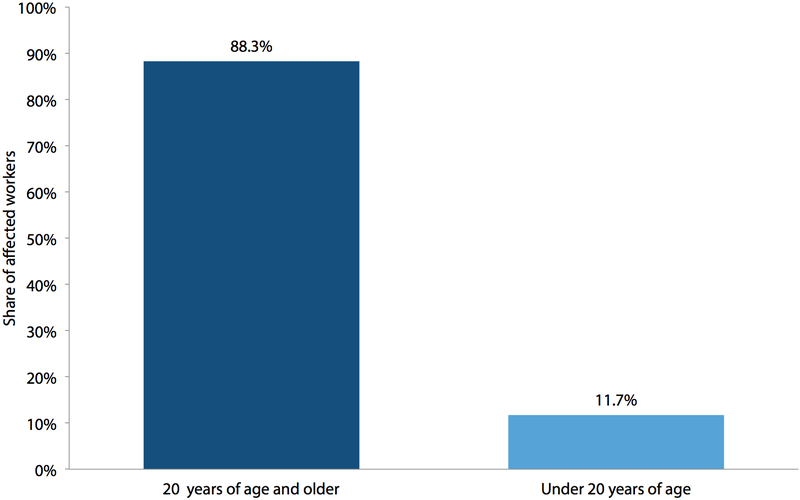 Over 88 percent of workers who would benefit are at least 20 years old. Although workers of all races and ethnicities would benefit from the increase, non-Hispanic white workers comprise the largest share (about 54 percent) of those who would be affected. About 44 percent of affected workers have at least some college education. Around 55 percent of affected workers work full time, 70 percent are in families with incomes of less than $60,000, more than a quarter are parents, and over a third are married. President Obama noted in his most recent State of the Union address that a parent who is a minimum-wage worker and works full time, year round, does not earn enough to be above the federal poverty line. This was not always the case. Figure A shows the annual earnings of a minimum-wage worker compared with the federal poverty line for a family of two or three. 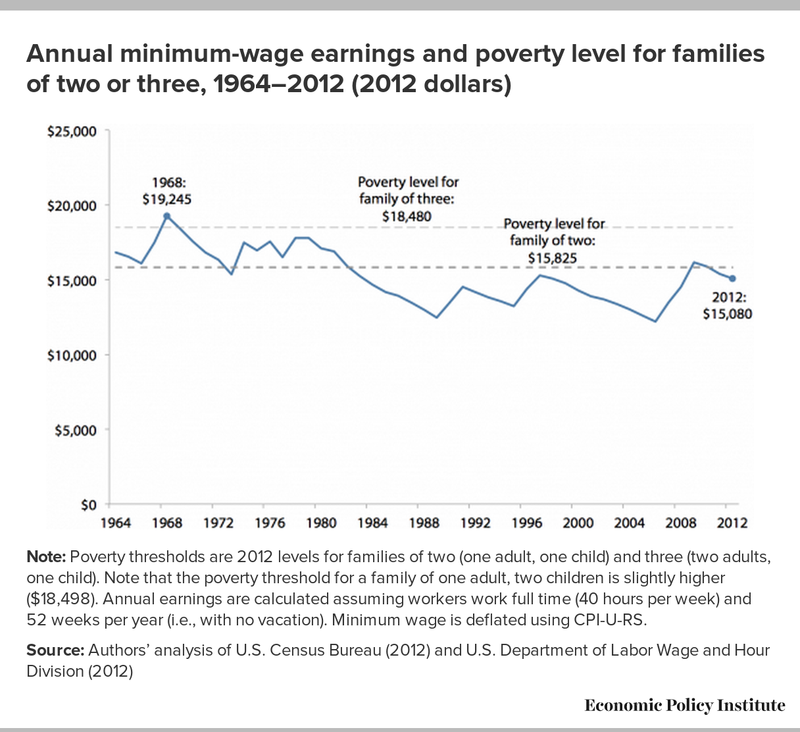 Until the 1980s, earning the minimum wage was enough to lift a single parent out of poverty. 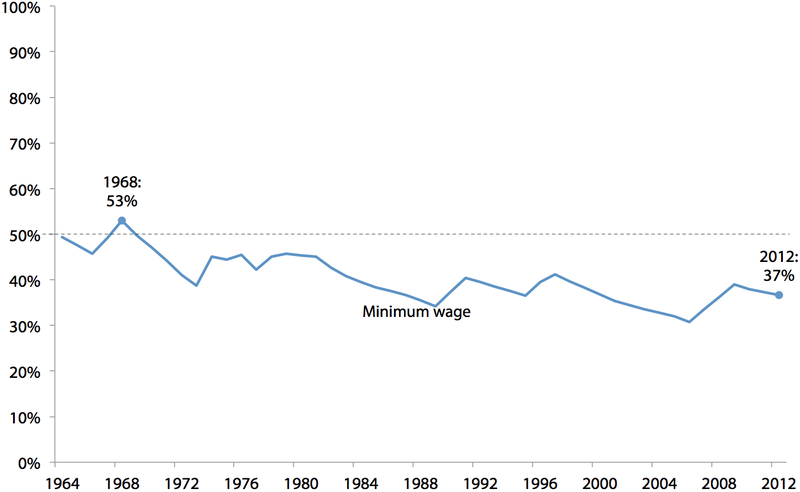 Indeed, a minimum-wage income in 1968 was higher than the poverty line for a family of two adults and one child. But as the figure shows, today’s minimum wage is not enough for single parents to reach even the most basic threshold of adequate living standards. 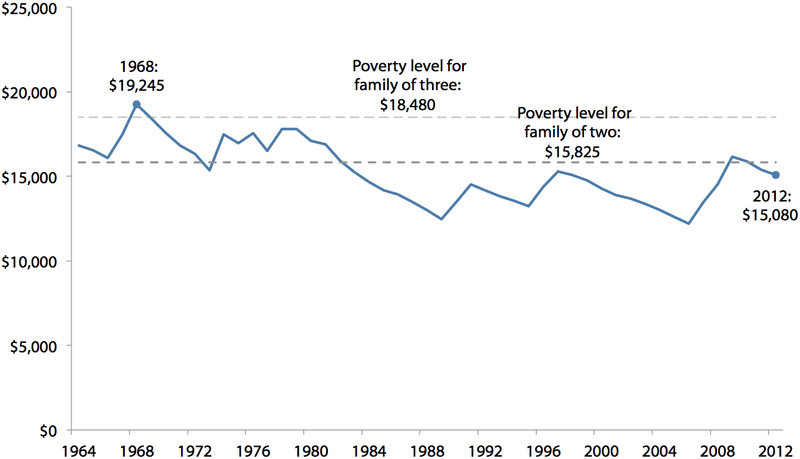 Note: Poverty thresholds are 2012 levels for families of two (one adult, one child) and three (two adults, one child). Note that the poverty threshold for a family of one adult, two children is slightly higher ($18,498). Annual earnings are calculated assuming workers work full time (40 hours per week) and 52 weeks per year (i.e., with no vacation). Minimum wage is deflated using CPI-U-RS. Moreover, the gap between the minimum wage and the average wage of production and nonsupervisory workers used to be much smaller. Figure B shows the minimum wage as a percentage of the average wage. 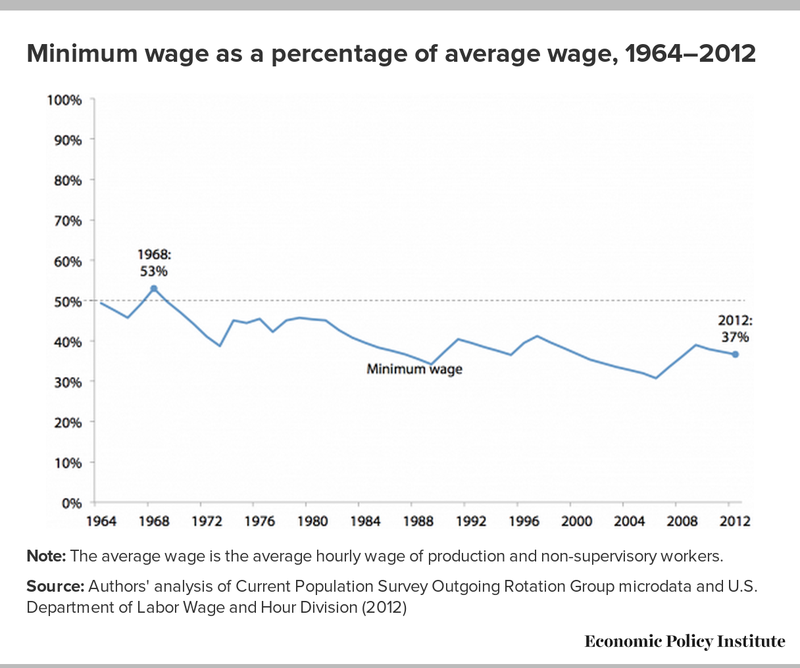 Through the 1960s, minimum-wage workers earned about 50 percent of what the average American production worker earned. Over time, as the value of the minimum wage has eroded, the wage gap between minimum-wage workers and the average American wage earner has grown to the point where, today, a minimum-wage worker earns only 37 percent of the average wage. Note: The average wage is the average hourly wage of production and non-supervisory workers. 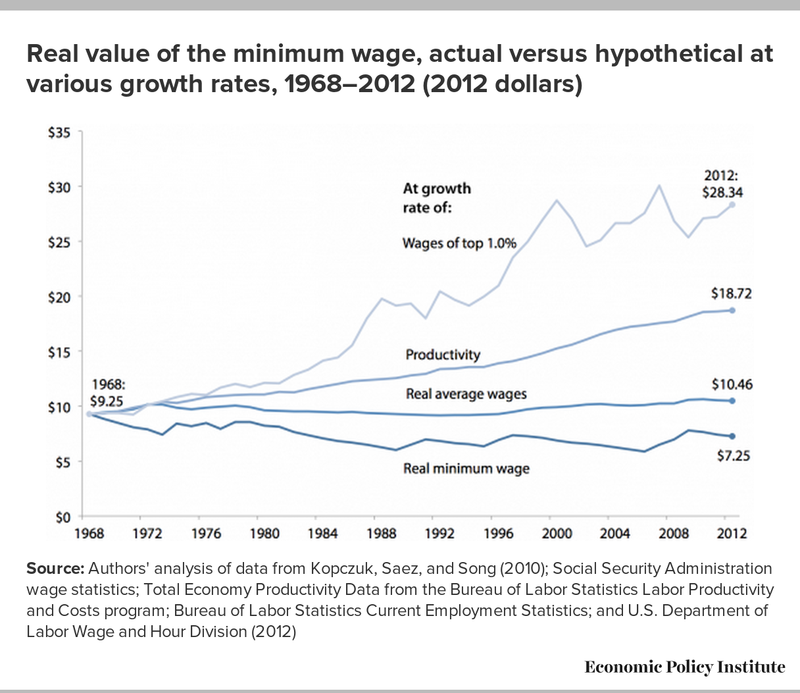 Over the last 45 years, minimum-wage workers have not seen the benefits of a growing economy. As productivity has increased and the economy has expanded, our capacity to generate income and raise overall living standards has grown dramatically. Yet the minimum wage has been left to stagnate, effectively preventing the country’s lowest-paid workers from sharing in this increased prosperity. Figure C depicts the actual value of the minimum wage over time, compared with what it might have been under three alternative scenarios. Increasing the minimum wage to $10.10 would benefit millions of workers whose characteristics—in terms of their gender, age, race and ethnicity, educational attainment, work hours, family income, and family composition—contradict some prevailing beliefs about minimum-wage workers. In the first year, with an increase from $7.25 to $8.20, 14 million directly and indirectly affected workers would see higher wages. This number would rise to about 21 million workers with the second incremental increase to $9.15 in 2014, and to more than 30 million workers with the third incremental increase to $10.10 in 2015, as shown in Figure D.4As detailed later in this section, the vast majority of these workers are not teenage part-time workers; rather, most are at least 20 years old, over half work full time, and many are struggling to support their families. Raising the minimum wage is a women’s issue. While increasing the minimum wage would have a sizable impact on both men and women, it would disproportionately affect women. 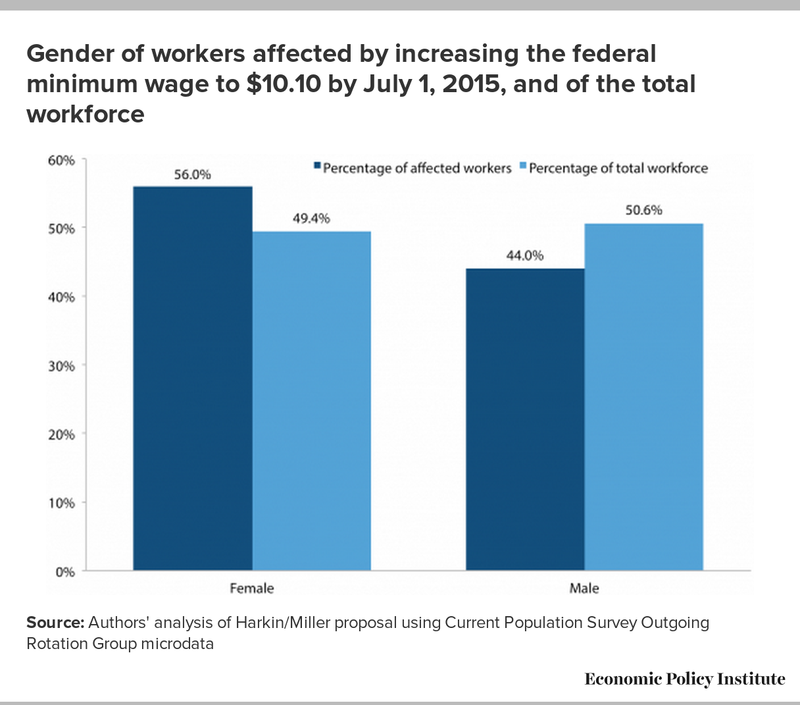 Women comprise 49.4 percent of U.S. workers, yet 56.0 percent of workers who would be affected by a potential minimum-wage increase (see Figure E). Minimum-wage workers are older and, as discussed later, have greater family responsibilities than commonly portrayed. 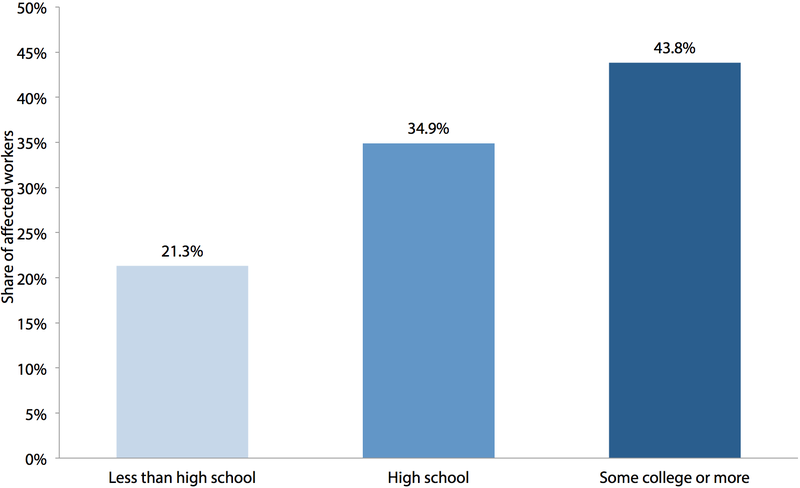 The facts do not support the perception of minimum-wage workers as primarily teenagers working for spending money (though even if true, it would not justify paying teens subpoverty wages). 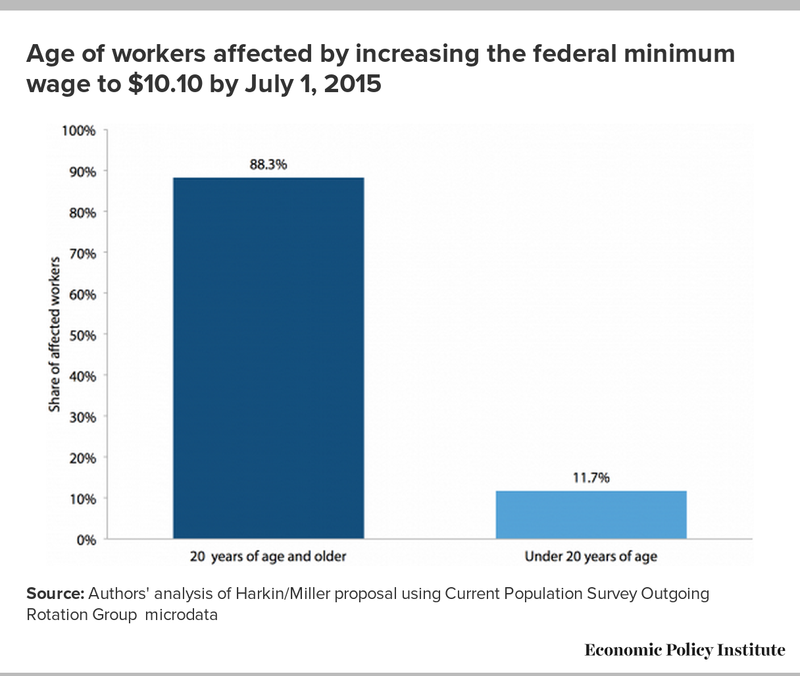 Instead, as seen in Figure F, 88.3 percent of workers who would be affected by increasing the federal minimum wage to $10.10 are at least 20 years old. This share varies from a low of 79.4 percent in New Hampshire to 94.4 percent in Louisiana (and 94.6 percent in the District of Columbia). Thus, in every state, more than three-fourths of workers who would be affected are at least 20 years old. 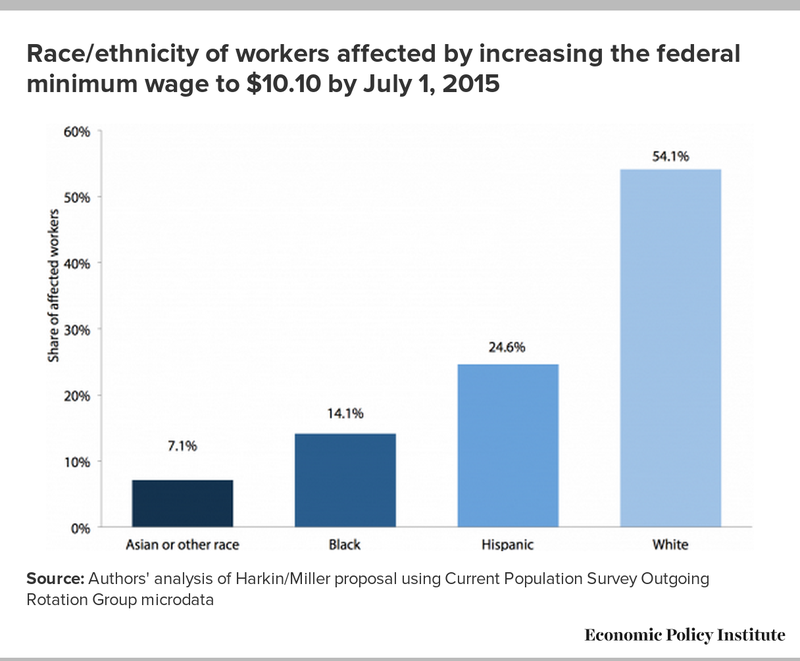 Increasing the minimum wage would substantially benefit both minority and nonminority workers. Figure G reveals that nationally, 54.1 percent of workers who would be affected are non-Hispanic white workers. 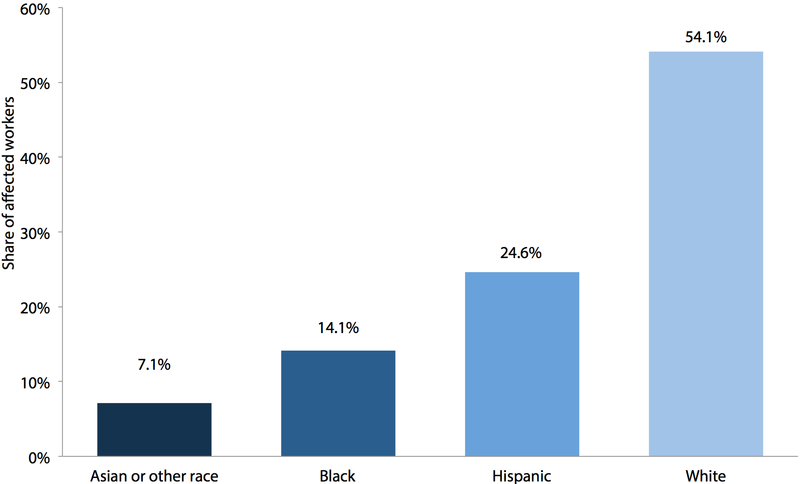 Nearly a quarter (24.6 percent) are Hispanic, 14.1 percent are black, and 7.1 percent are Asian or of another race or ethnicity. The Asian or other race/ethnicity composition ranges from 1.7 percent in West Virginia to 75.9 percent in Hawaii. The black composition ranges from less than 1 percent in Idaho, Montana, and New Hampshire to 46.5 percent in Mississippi (and 57.1 percent in the District of Columbia). The Hispanic composition ranges from 0.9 percent in West Virginia to 58.6 percent in California. The white composition ranges from 10.7 percent in Hawaii to 93.5 percent in Maine. 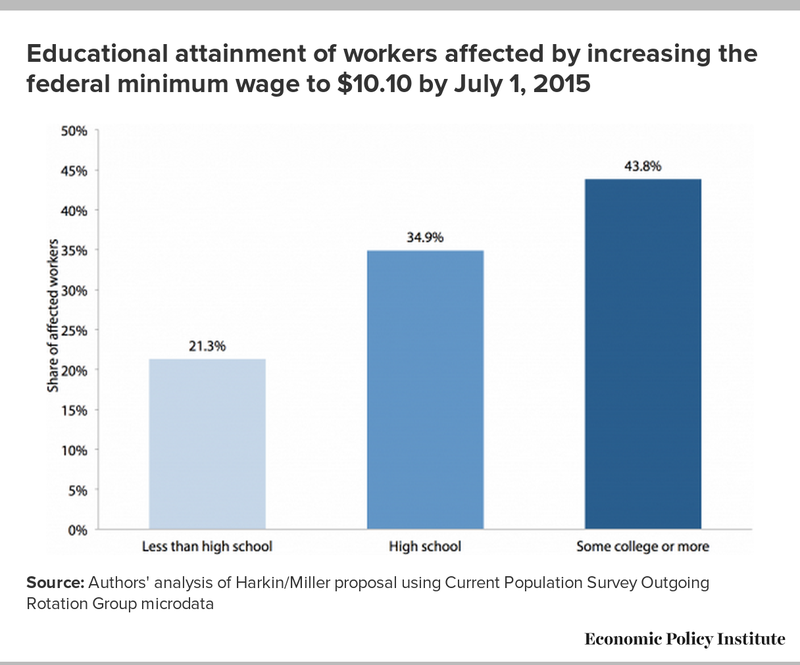 Data on educational attainment of those who would be affected by a minimum-wage increase further dispel the misperception of minimum-wage workers as high school students. In fact, nationally just 21.3 percent of those who would be affected have less than a high school degree, while fully 43.8 percent have some college education, an associate degree, or a bachelor’s degree or higher (see Figure H). This share ranges from 37.8 percent in Texas (and 34.4 percent in the District of Columbia) to 53.6 percent in Massachusetts. 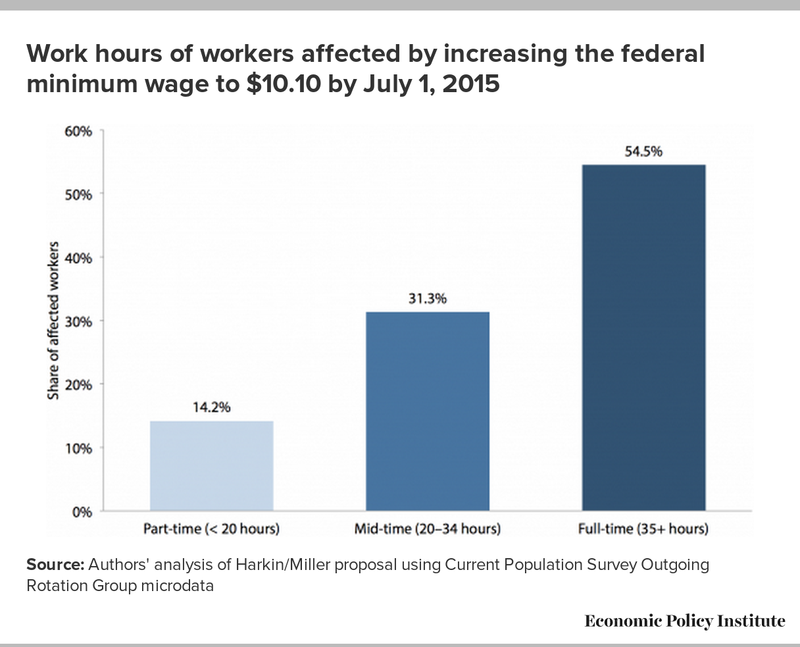 Among those who would be affected by increasing the minimum wage to $10.10, only 14.2 percent are part-time workers (defined as those who work less than 20 hours per week). 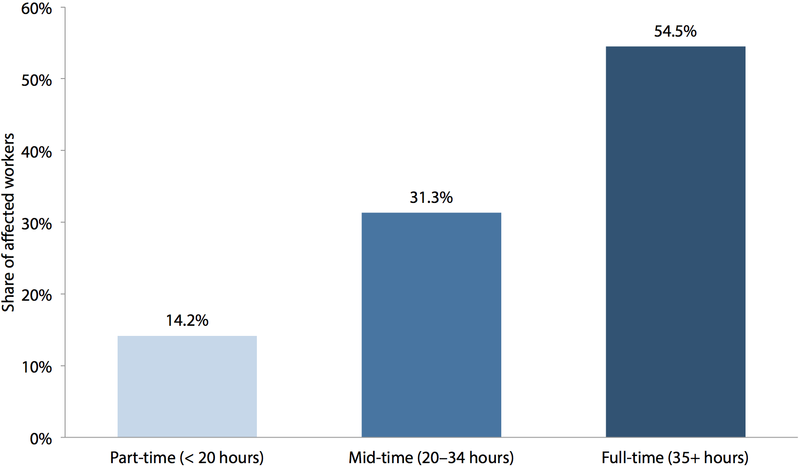 More than half (54.5 percent) work full time (35 or more hours per week), while 31.3 percent work mid-time, between 20 and 34 hours per week, as seen in Figure I. A series of figures at the end of this paper depict outcomes by state. 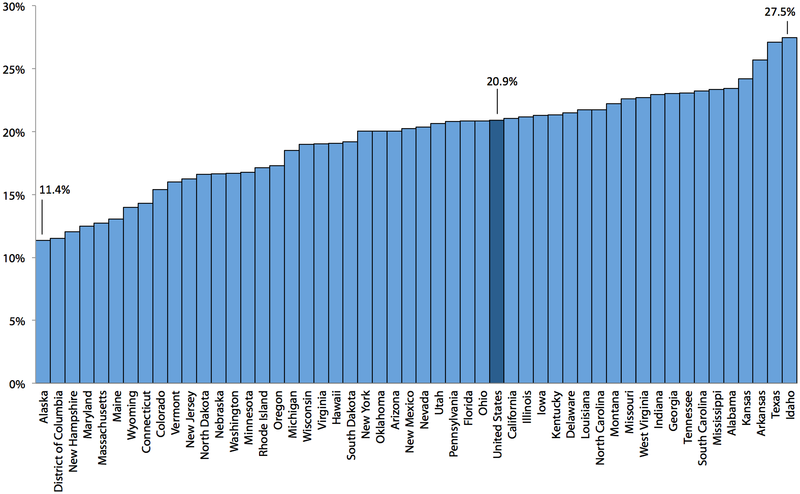 As depicted in Figure K, Southern states generally have a much smaller share of affected workers who work part time. The states with the lowest shares include Mississippi (7.8 percent), Arkansas (8.7 percent), and Louisiana (8.8 percent). (The District of Columbia’s share stands at 8.6 percent.) 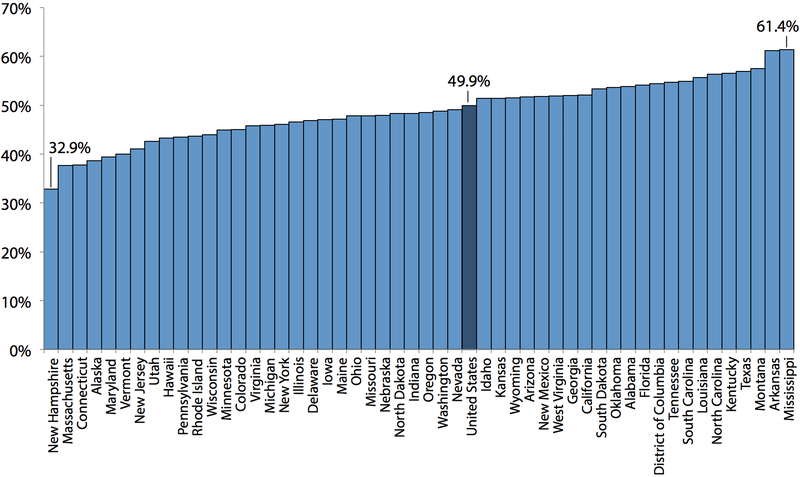 States with the highest shares of affected workers who work part time include states primarily concentrated in the North, led by New Hampshire (26.9 percent), Vermont (25.0 percent), and Minnesota (23.9 percent). 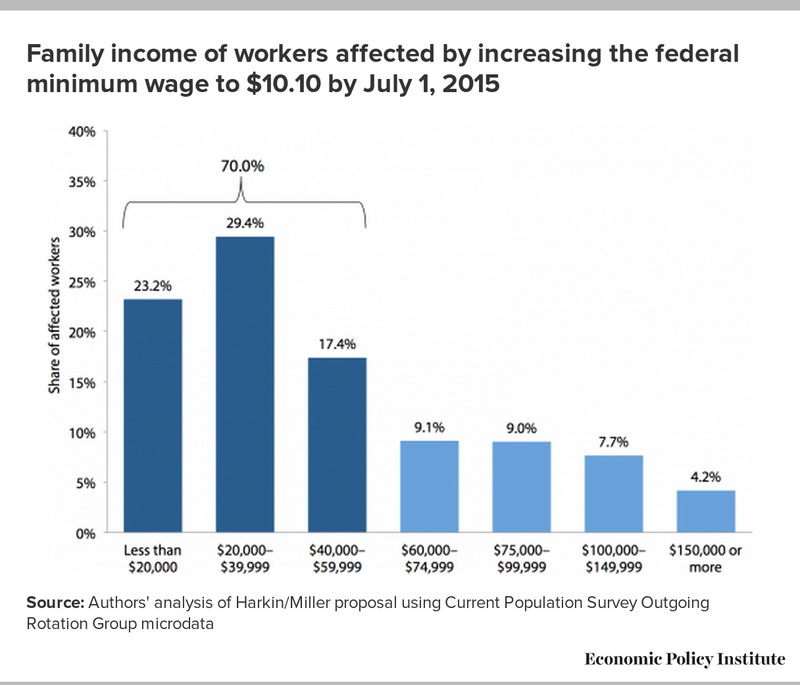 The family income of those who would be affected by a minimum-wage increase is generally low to moderate. 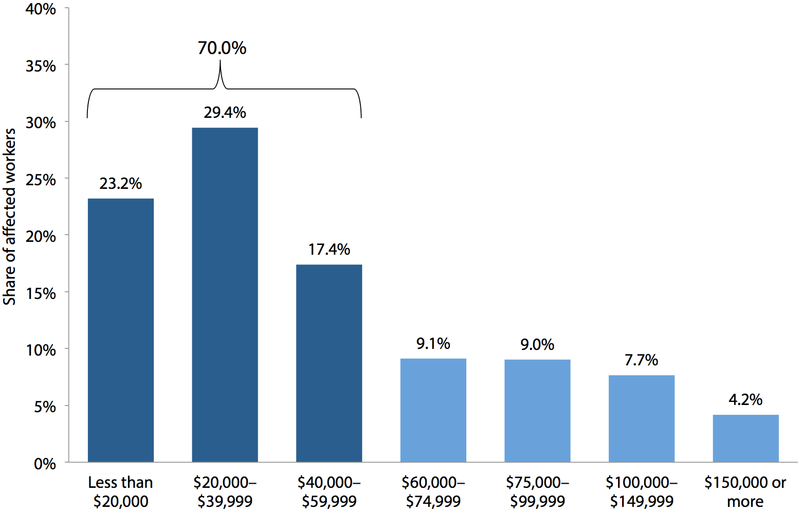 As shown in Figure J, 70.0 percent of affected families have a total family income of less than $60,000, and nearly a quarter (23.2 percent) have total family income of less than $20,000. Among all U.S. families, the median family income in 2011 was $61,455 (according to data from the American Community Survey). 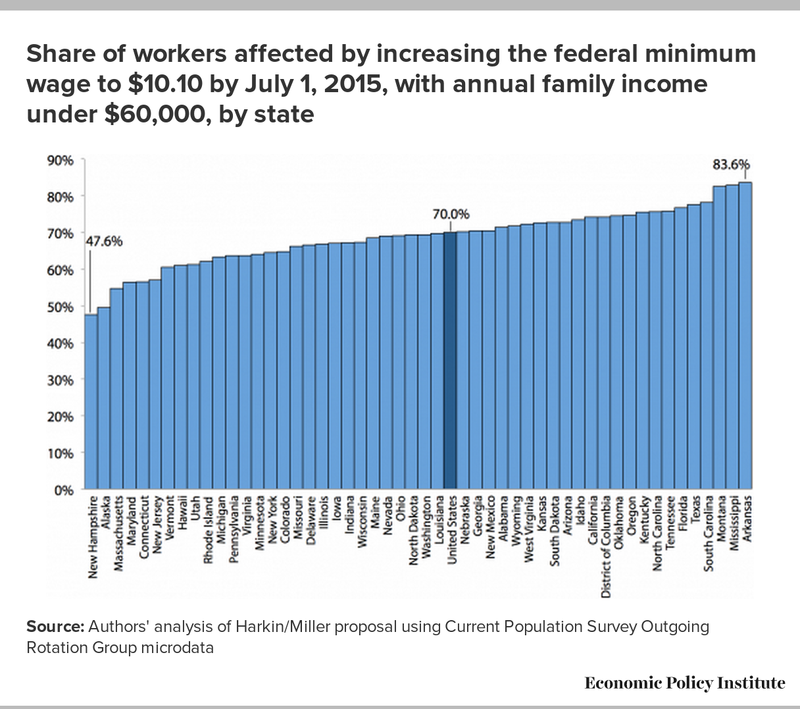 The share of families affected by increasing the federal minimum wage to $10.10 with family income under $60,000 varies considerably by state, from nearly half (47.6 percent) in New Hampshire to more than four-fifths in Arkansas (83.6 percent), Mississippi (82.9 percent), and Montana (82.6 percent), as seen in Figure L.
Those who would be affected by increasing the minimum wage to $10.10 are vital contributors to their families’ earnings. Nationally, the average affected worker earns half (49.9 percent) of his or her family’s total income. 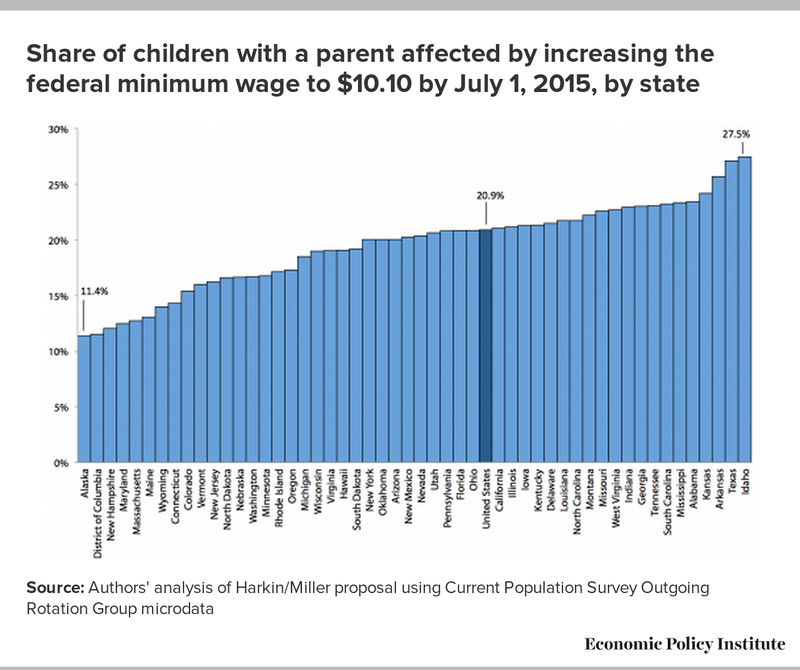 This percentage varies from a low of 32.9 percent in New Hampshire to a high of 61.4 percent in Mississippi, as shown in Figure M.
Nationally, over a quarter (27.9 percent) of those who would be affected by increasing the minimum wage to $10.10 are parents, while over a third (35.8 percent) are married (according to an analysis of Current Population Survey Outgoing Rotation Group microdata). 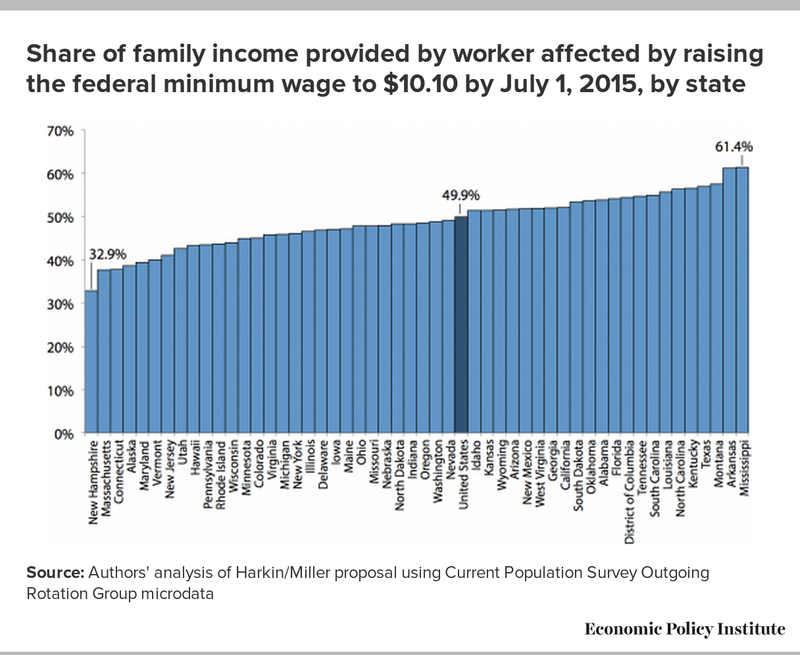 Moreover, of the 75 million children in the United States, more than one-fifth (20.9 percent) have a parent who would benefit from the proposed federal minimum-wage increase. 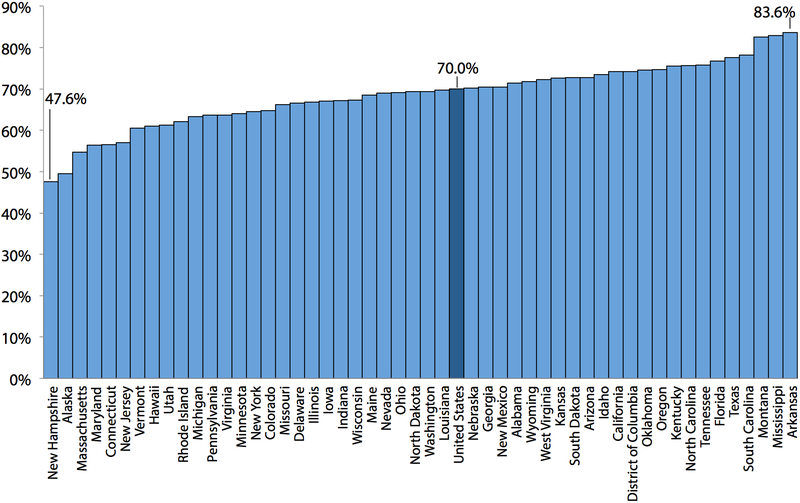 This percentage varies from 11.4 percent in Alaska to 27.5 percent in Idaho, as shown in Figure N. Eight other states where roughly a quarter of children have a parent who would benefit from the minimum-wage increase include Texas (27.1 percent), Arkansas (25.7 percent), Kansas (24.2 percent), Alabama (23.4 percent), South Carolina (23.2), Tennessee (23.1 percent), and Georgia (23.0 percent). Of the nine states where roughly a quarter of children have an affected parent, all but Idaho and Kansas had child poverty rates of 25 percent or more in 2011 (Annie E. Casey Foundation 2012), highlighting the importance of boosting their family incomes by raising the minimum wage. In short, a minimum-wage increase would boost the wages of a diverse multitude of American workers—and would thus have widespread economic benefits. The following section details the magnitude of these economic effects. The immediate benefits of a minimum-wage increase are in the boosted earnings of the lowest-paid workers, but its positive effects would far exceed this extra income. Recent research reveals that, despite skeptics’ claims, raising the minimum wage does not cause job loss.6 In fact, throughout the nation, a minimum-wage increase under current labor market conditions would create jobs. Like unemployment insurance benefits or tax breaks for low- and middle-income workers, raising the minimum wage puts more money in the pockets of working families when they need it most, thereby augmenting their spending power. Economists generally recognize that low-wage workers are more likely than any other income group to spend any extra earnings immediately on previously unaffordable basic needs or services. Increasing the federal minimum wage to $10.10 by July 1, 2015, would give an additional $51.5 billion over the phase-in period to directly and indirectly affected workers,7 who would, in turn, spend those extra earnings. Indirectly affected workers—those earning close to, but still above, the proposed new minimum wage—would likely receive a boost in earnings due to the “spillover” effect (Shierholz 2009), giving them more to spend on necessities. This projected rise in consumer spending is critical to any recovery, especially when weak consumer demand is one of the most significant factors holding back new hiring (Izzo 2011).8 Though the stimulus from a minimum-wage increase is smaller than the boost created by, for example, unemployment insurance benefits, it has the crucial advantage of not imposing costs on the public sector. Showing that raising the minimum wage would be a tool for modest job creation requires an examination of the stimulative effects of minimum-wage increases. Because minimum-wage increases come from employers, we must construct a “minimum-wage increase multiplier” that takes into account the increase in compensation to low-wage workers and the decrease in corporate profits that both occur as a result of minimum-wage increases. Raising the minimum wage means shifting profits from an entity (the employer) that is much less likely to spend immediately to one (the low-wage worker) that is more likely to spend immediately. Thus, increasing the minimum wage stimulates demand for goods and services, leading employers in the broader economy to bring on new staff to keep up with this increased demand. Using these same standard fiscal multipliers to analyze the jobs impact of an increase in compensation of low-wage workers and decrease in corporate profits that result from a minimum-wage increase, we find that increasing the national minimum wage from $7.25 to $10.10 per hour by July 1, 2015, would result in a net increase in economic activity of approximately $32.6 billion over the phase-in period, and over that period would generate approximately 140,000 new jobs (see Appendix for methodological details).10 In fact, the hike in the federal minimum wage would create jobs in every state, as seen in Appendix Table 1. (Detailed state-level breakdowns of the demographics of workers who would be affected by the increase—and the degree to which the wages of various types of workers would rise—are available here.) Though the resulting employment impact is modest in the context of the millions of workers currently unemployed nationwide, creating tens of thousands of jobs would be a step in the right direction and would boost the economy. Examining the positive effects of a minimum-wage increase leads to an overarching discussion of the economic case for increasing the earnings of the lowest-paid workers while the labor market is weak. In the current economic climate, nearly everything is pushing against wage growth. With 3.4 unemployed workers for each job opening (Shierholz 2013), employers do not have to offer substantial wages to hire the workers they need, nor do they have to pay substantial wage increases to retain workers. Indeed, between 2009 (when the last minimum-wage increase took place) and 2011 (the most recent year for which data are available), nearly every state experienced wage erosion at the 20th percentile (according to an analysis of Current Population Survey data). Even conservative economists suggest higher wages might help speed the recovery. American Enterprise Institute scholar Desmond Lachman, a former managing director at Salomon Smith Barney, told The New York Times, “Corporations are taking huge advantage of the slack in the labor market—they are in a very strong position and workers are in a very weak position. They are using that bargaining power to cut benefits and wages, and to shorten hours.” According to Lachman, that strategy “very much jeopardizes our chances of experiencing a real recovery” (Powell 2011). Furthermore, the national unemployment rate currently stands at 7.7 percent and is not expected to return to prerecession levels for several years. Considering the past year’s sluggish job growth rate, a minimum-wage increase that creates about 140,000 net new jobs would help strengthen the recovery. The multiple positive effects that would result from a higher minimum wage are clear: It would boost the earnings of working families hardest hit by the Great Recession, spur economic growth, and create about 140,000 net new jobs. In an economic climate in which wage increases for the most vulnerable workers are scarce, raising the minimum wage to $10.10 by July 1, 2015, is an opportunity that America’s working families cannot afford to lose. — David Cooper joined the Economic Policy Institute in July 2011. He conducts national and state-level research on a variety of issues, including labor markets, poverty, and economic development. He also provides support to the Economic Analysis and Research Network (EARN) on data-related inquiries and quantitative analyses. David worked previously as an economic policy analyst at the Bipartisan Policy Center, where he focused on federal budget policy. He has also worked in higher education development and in political consulting. His graduate research focused on international development policy and social mobility. He has a master’s in public policy from Georgetown University. * Part-time workers are defined as those working less than 20 hours per week. An analysis of the stimulative impact of raising the minimum wage draws on the macroeconomic multipliers calculated by Moody’s Analytics Chief Economist Mark Zandi (2011), which estimate the one-year dollar change in gross domestic product (GDP) for a given dollar reduction in federal tax revenue or increase in spending. Averaging the stimulus multipliers of the Earned Income Tax Credit (within the parameters of the American Recovery and Reinvestment Act, or ARRA) and Making Work Pay (ARRA’s refundable tax credit for working individuals and families) gives a reasonable fiscal stimulus multiplier for the spending increase due to the increase in compensation of low-wage workers. This value is 1.2, which means that a $1 increase in compensation to low-wage workers leads to a $1.20 increase in economic activity. The calculation of the stimulative impact of the minimum wage, however, must also account for the offsetting shift from employers. We assume employers pass on some of the minimum-wage increase (somewhere between 20 percent and 50 percent) to consumers through increased prices. Thus, we calculate the offsetting multiplier effects as a weighted average of Zandi’s across-the-board tax cut (1.04, as a proxy for increased prices) and a cut in the corporate tax rate (0.32). (representing the case where 20 percent of the minimum-wage increase is passed through to prices). 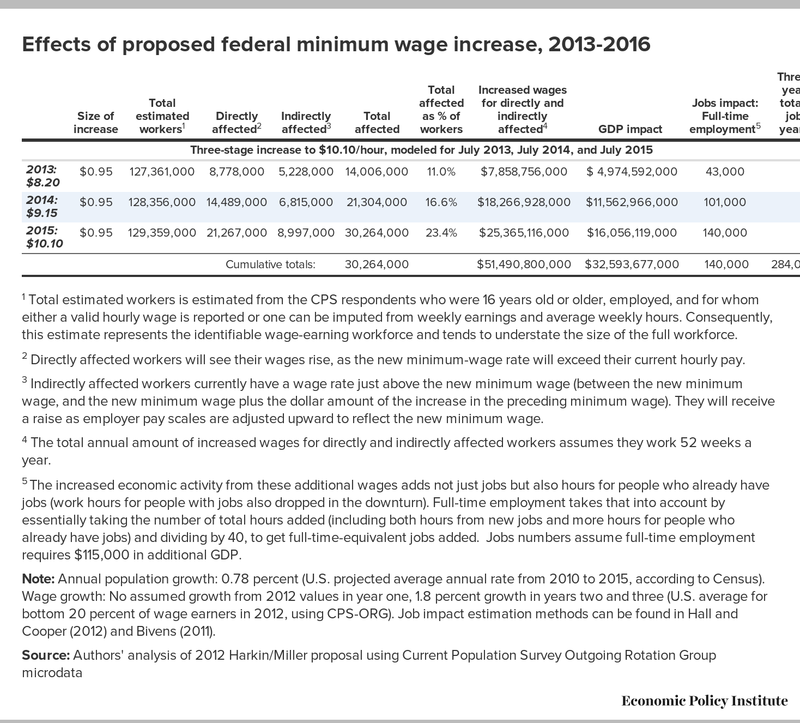 Taking into account the fiscal stimulus multiplier range of the minimum-wage increase (0.53 to 0.74) and the increased wages (“wage bill increase”) of directly and indirectly affected workers, we can calculate the GDP impact of the proposal to increase the minimum wage to $10.10. 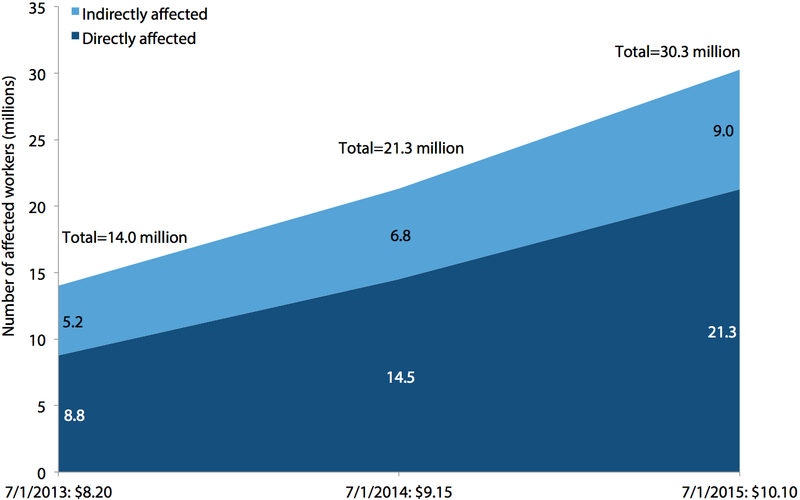 $51,490,800,000 total wage bill increase × 0.74 minimum-wage multiplier (high) = $38,154,682,800 GDP impact (high). $38,154,682,800 GDP impact (high)/$115,000 GDP increase per FTE job = 331,780 FTE job years. Thus, we would say that approximately 283,423 FTE job years would be created. Full-time-equivalent job measurements take into account both the increase in the number of payroll jobs and the increase in work hours for those who already had jobs by calculating the equivalent number of 40-hour-per-week jobs that would be created by the GDP boost. The figures above describe the job-creation impact of the total increase in wages resulting from all three stages of the proposed increase in the minimum wage. However, a more conservative estimate would take into account the jobs retained from the previous year in the second and third steps of the three-stage increase. Appendix Table 2 shows the job years supported by each stage of the proposed increase. As shown in the table, an increase in the federal minimum wage to $10.10 on July 1, 2015, would—in the year following its full implementation—result in 140,000 jobs (101,000 of which would be retained from year two, with the remainder created in year three). Over the course of the three yearly incremental increases, a conservative estimate of the total job years that would be created is approximately 284,000. 1 Total estimated workers is estimated from the CPS respondents who were 16 years old or older, employed, and for whom either a valid hourly wage is reported or one can be imputed from weekly earnings and average weekly hours. Consequently, this estimate represents the identifiable wage-earning workforce and tends to understate the size of the full workforce. 3 Indirectly affected workers currently have a wage rate just above the new minimum wage (between the new minimum wage, and the new minimum wage plus the dollar amount of the increase over the preceding minimum wage). They will receive a raise as employer pay scales are adjusted upward to reflect the new minimum wage. 4 The annual amount of increased wages for directly and indirectly affected workers assumes they work 52 weeks a year. 5 GDP and job impact figures utilize a national model to estimate the GDP impact of workers' increased earnings. Thus, the total state stimulus may be lower than this amount because workers in each state will not necessarily spend all of their increased earnings in-state. However, we can assume that most of the increased earnings will be spent in-state, and thus most of the jobs created will be in-state. GDP figures are cumulative three-year totals, job-impact figures are the jobs created or sustained in the final year of the increases. 6 The increased economic activity from these additional wages adds not just jobs but also hours for people who already have jobs (work hours for people with jobs also dropped in the downturn). Full-time employment takes that into account by essentially taking the number of total hours added (including both hours from new jobs and more hours for people who already have jobs) and dividing by 40, to get full-time-equivalent jobs added. Jobs numbers are job years following the third-year increase. Figures assume full-time employment requires $115,000 in additional GDP. Note: Figures may not sum to total due to rounding. Job impact estimation methods can be found in Hall and Cooper (2012) and Bivens (2011). 3 Indirectly affected workers currently have a wage rate just above the new minimum wage (between the new minimum wage, and the new minimum wage plus the dollar amount of the increase in the preceding minimum wage). They will receive a raise as employer pay scales are adjusted upward to reflect the new minimum wage. 4 The total annual amount of increased wages for directly and indirectly affected workers assumes they work 52 weeks a year. 5 The increased economic activity from these additional wages adds not just jobs but also hours for people who already have jobs (work hours for people with jobs also dropped in the downturn). Full-time employment takes that into account by essentially taking the number of total hours added (including both hours from new jobs and more hours for people who already have jobs) and dividing by 40, to get full-time-equivalent jobs added. Jobs numbers assume full-time employment requires $115,000 in additional GDP. Note: Annual population growth: 0.78 percent (U.S. projected average annual rate from 2010 to 2015, according to Census). Wage growth: No assumed growth from 2012 values in year one, 1.8 percent growth in years two and three (U.S. average for bottom 20 percent of wage earners in 2012, using CPS-ORG). Job impact estimation methods can be found in Hall and Cooper (2012) and Bivens (2011). 1. The phase-in period modeled for this report would commence upon enactment of the initial minimum-wage increase (assumed in this study to be July 1, 2013) and run through June 30, 2016, though there is no way to precisely allocate the distribution of the GDP impact and related job creation following each incremental increase in the minimum wage. 2. Here, productivity refers to total economy productivity. 3. Inflation projections were made using the Congressional Budget Office’s inflation projections for the Consumer Price Index. 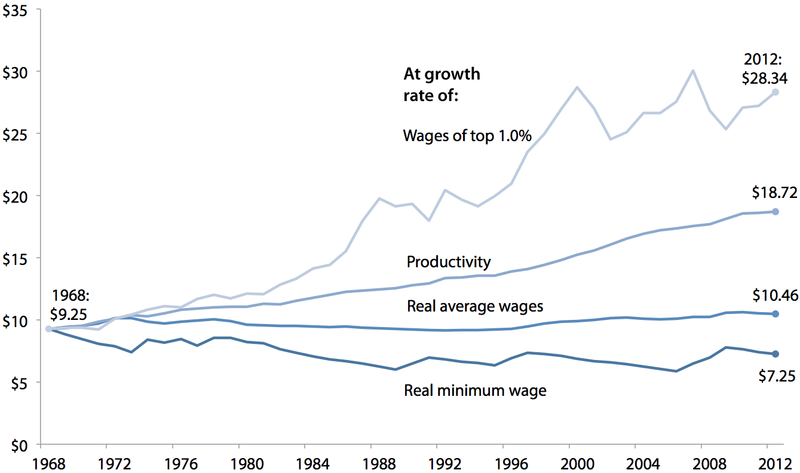 Productivity, average wages, and wages of the top 1.0 percent were projected out from their 2012 or 2011 values at the average annual growth rate for each series from 2002 to 2006, the last full regular business cycle. 4. 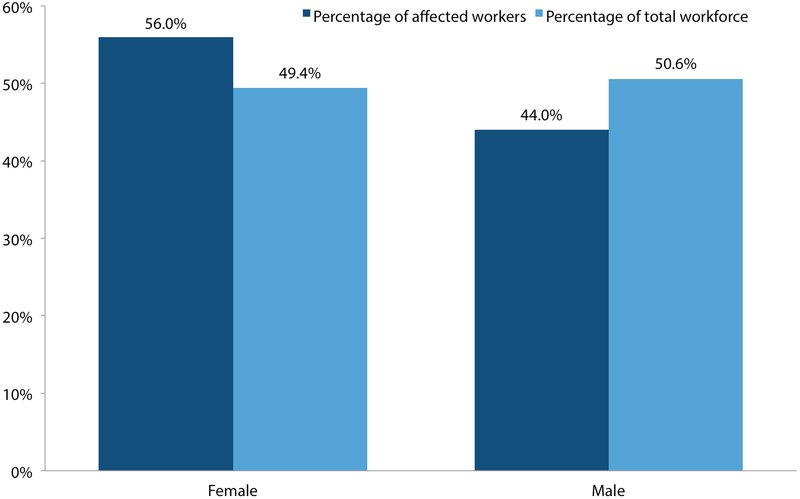 These data, and the data presented throughout this issue brief, include directly affected workers (those who would see their wages rise because the new minimum wage would exceed their current hourly pay) and indirectly affected workers (those who would receive a raise as employer pay scales are adjusted upward to reflect the higher minimum wage). 5. These, and all other national and state-level demographic statistics, were generated through the authors’ analysis of Current Population Survey Outgoing Rotation Group microdata from the Bureau of Labor Statistics. 6. 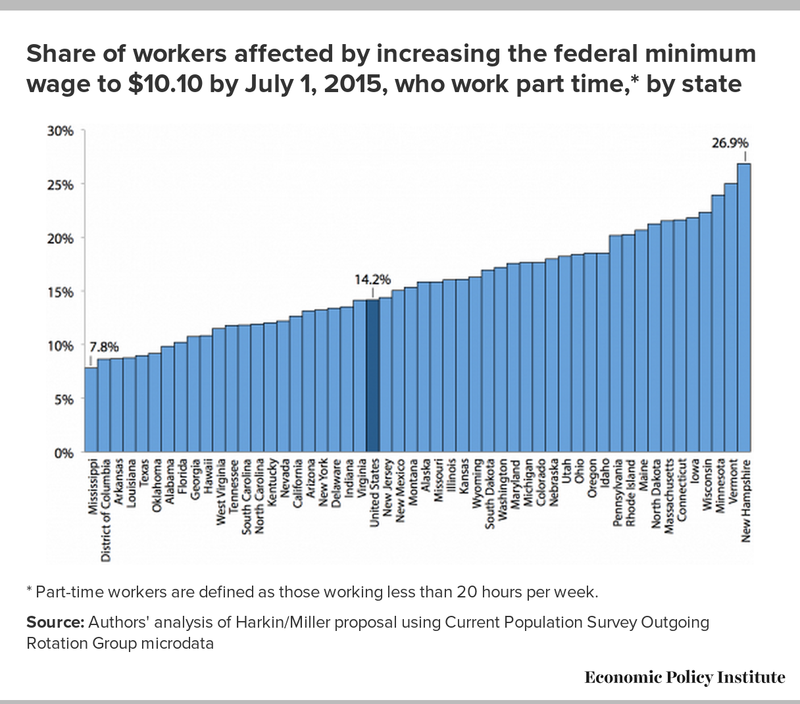 See the EPI paper The Benefits of Raising Illinois’ Minimum Wage: An Increase Would Help Working Families and the State Economy (Hall and Gable 2012) or Why Does the Minimum Wage Have No Discernible Effect on Employment? (Schmitt 2012) for a summary of the definitive studies on minimum-wage increases and the absence of disemployment effects. 7. The increased wages are the annual amount of increased wages for directly and indirectly affected workers, assuming they work 52 weeks per year. 8. In a poll of 53 economists by The Wall Street Journal, the majority (65 percent) cited a lack of demand as the main reason for a lack of new hiring by employers (Izzo 2011). 9. In a paper on the methodology used to estimate the jobs impact of various policy changes, the Economic Policy Institute’s Josh Bivens found that $115,000 in additional economic activity results in the creation of one new full-time-equivalent job (Bivens 2011). 10. Jobs created as a result of increased GDP are measured in job years. (One full-time job held for one year is one job year. Two full-year, part-time jobs equaling a total of 40 hours a week, 52 weeks a year equal one job year. Two half-year full-time jobs equal one job year.) In each subsequent year of minimum-wage increase, there would be a net increase in the number of jobs created. In the first year, approximately 43,000 jobs would be created. In the second year, new jobs would be created and the jobs created in year one would be sustained, totaling approximately 101,000. In the third year, new jobs would be created and the jobs from years one and two would be sustained, totaling about 140,000 full-time-equivalent jobs. This number is the best approximation of how many net new jobs would result from the economic impact of increasing the minimum wage to $10.10. The sum of jobs that would be created in years one, two, and three brings a multi-year total of 284,000 job years. Annie E. Casey Foundation. 2012. 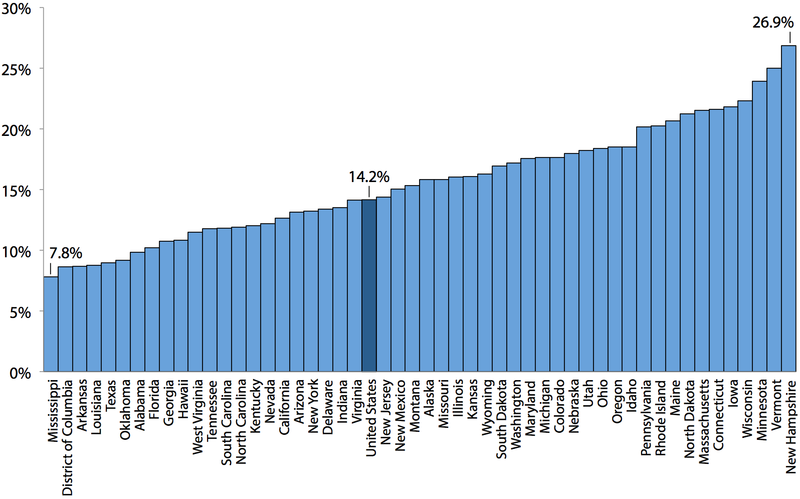 2012 KIDS COUNT Data Book: State Trends in Child Well-Being. Baltimore: Annie E. Casey Foundation.